Primary use for Federal Government or Export Only. This product is not FCC approved for general use within the United States. ALE is a system which automatically selects the most suitable channel and establishes a communication link. The ALE provides interoperability with other manufactures compliant with the FED-STD-1045A ALE. ALE individual call, net call, sounding and AMD (Automatic message display) are available. 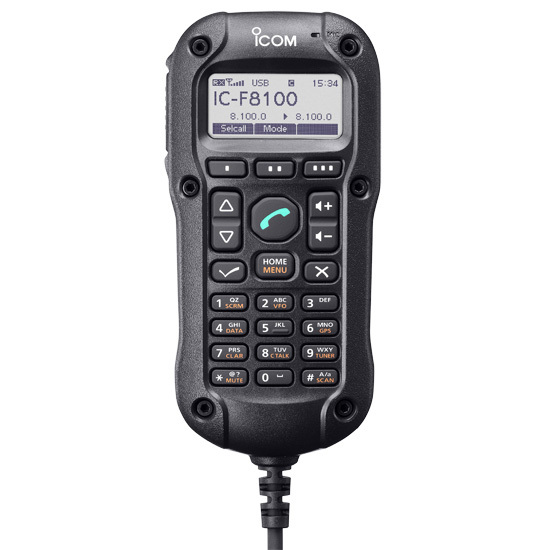 The IC-F8100 offers CCIR493 based 4 and 6 digit open selcall which is commonly used in HF network and 4 and 6 digit Icom F7000 compatible selcall system. Selcall allows you to make selective calling, phone call, message call, position call, status call, emergency call and channel test call. 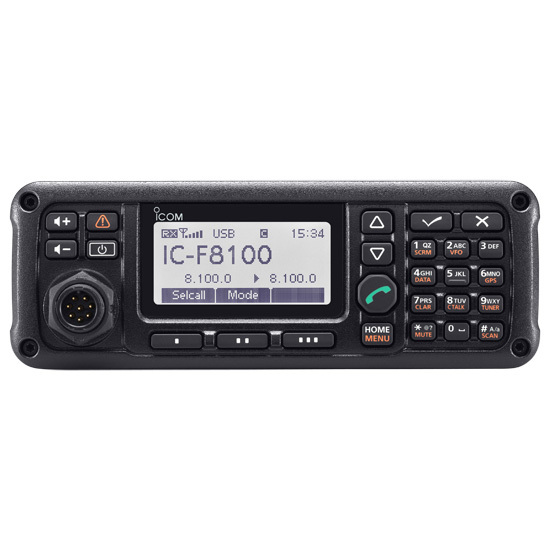 The IC-F8100 has a fanless, enclosed structure securely sealed from intrusion by all potential elements and visibly more compact than the previous models. The IC-F8100, CFU-F8100 and AD-119 have been tested to MIL-STD-810-G and IP54 ratings. Also, most of connection cables and connectors employ IP54 water resistant sealing. A full 125W output power at full duty cycle voice mode operation is possible with the fanless design. 25% duty cycle operation is possible at data mode operation (Max. 5 minutes of continuous transmission). However, when used with an optional external cooling fan unit, CFU-F8100, the IC-F8100 ensures full duty cycle data and voice mode operations to absolutely reliability during long continuous transmit cycles or for operation in hot climates. 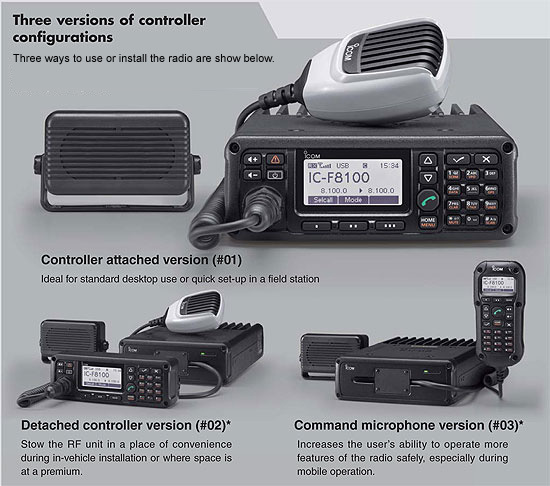 Despite the multitude of features, the IC-F8100 is designed for simple, straight forward operation. According to the operating status, the function ( P 1 – P 3 ) buttons change the assigned functions and show the assigned functions at the bottom line of the display. The clear talk function automatically reduces the noise and eliminates the need to be an expert operator at the touch of a button. 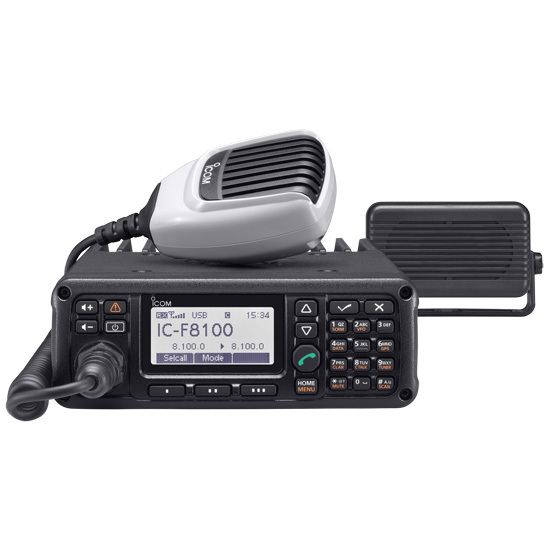 The IC-F8100 has 3 types of mute functions, call squelch, S-meter squelch and voice squelch. 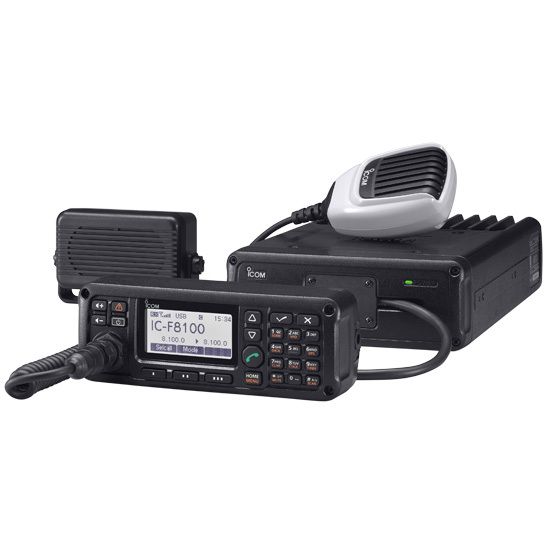 The call squelch function opens the squelch on when received a selcall or ALE call intended to the station and provides quiet standby. The DSP allows flexible filter width setting from wide, middle and narrow without an optional filter. External speaker: SP-25, DC power cable, spare fuses are supplied to all versions. 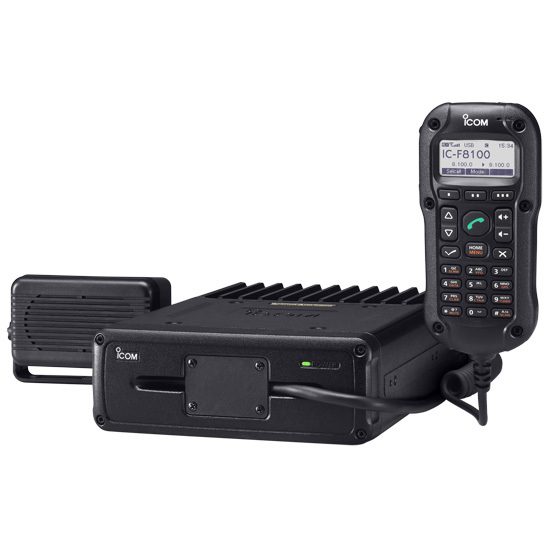 The IC-F8100 allows you to connect with various accessories such as PC, HF data modem, GPS* and antenna tuner* via the AD-119 Junction Box. *Antenna tuner/GPS cable (RF unit to AT-140 and a GPS receiver), USB cable (RF unit to PC) will be available soon. When connected an external GPS receiver, the IC-F8100 can send current position data to other station and shows position information, time, altitude and heading of movement on the display. 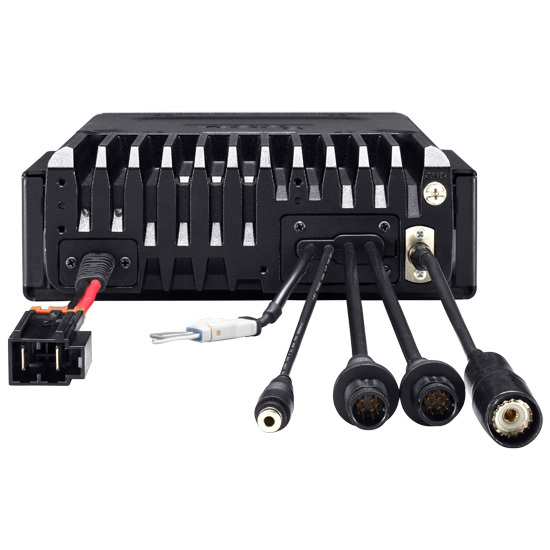 When used with the optional Junction Box, AD-119, the AD-119 has an installation space to fit a high speed HF data modem. * It allows HF e-mail operation using a PC connected via RS-232C cable (9-pin). * HF data modem is now under evaluation. Planned to be a recommended partner option.